Many companies pride themselves in taking an eco-friendly approach to business. Unfortunately, advertising doesn't always allow that to happen. Sometimes, materials that many would not consider to be good for the environment end up being used. Fortunately, NuMart Display has some great options for you. With eco-friendly stands you will have the chance to take advantage of some eco-conscious options that allow you to support your message of conservation. 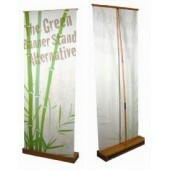 Your eco-friendly stands are designed with a bamboo frame that has been shown to be one of the best renewable resources around. Bamboo can grow at incredibly fast speeds, thanks to it being a grass, meaning that the wood like material it produces can be replenished quickly and minimize the negative effects the use of traditional wood has on our environment. You can proudly display your graphics and artwork on this stand and support pledge your conservation efforts, without appearing to be hypocritical in nature, thanks to the composition and design of this display. All while having a visually appealing design that will work into any design you have in mind for your trade show booth. Best of all, these lightweight options are going to be easy for you to carry on the go and to setup in no time at all. You will have the chance to display them outside on a whim, at trade shows to promote your business and in a number of other forums. Best of all, these eco-friendly stands can be reused time and again. 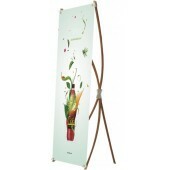 When combined with their already low cost, that also makes these stands a smart investment for any business. 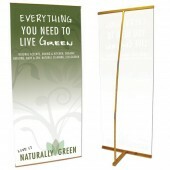 Each stand comes with the bamboo square base in addition to the full color graphic that you are looking to display. This will be a water and scratch resistant display that will have UV protection added. 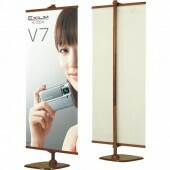 This will help to extend the life of the banner setup and ensure that you are able to minimize waste. That will further prove your commitment to the environment and to have a piece of advertising you can count on for years to come. When you are ready to take a greener approach to advertising, you will want to choose from the eco-friendly stands that are available. These stands are going to be the perfect way to showcase your company and your eco-friendly nature at the office, on the street and even in a trade show, allowing you to stand out.